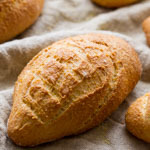 With a cross-section similar to that of a baguette, a crown is a delight for crust lovers. To maximize crustiness, make sure you bake the loaf until it is good and dark. Any leftover bread can be sliced thinly and baked in a low oven until crisp for some toasts that are wonderful with your morning coffee or after dinner with a smear of goat cheese. The crown should be proofed in a couronne basket, but if you don’t have one you can rig one up with an inverted bowl placed in a large basket and draped with a piece of linen. 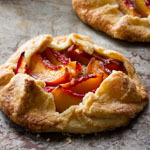 It could even be proofed upside-down on a floured board, but it’s easier to flip it over for baking if it’s in a basket. I’m sending this crown, along with warm wishes for a very happy New Year, to Annarasa and Zorra (1x umrühren bitte) for BreadBakingDay #15, Festive Breads. In the bowl of a stand mixer with dough hook, combine the flour, semolina, water, yeast, salt, olive oil, and starter. Mix on low speed until just combined, about 4 – 5 minutes. Adjust the water as needed to achieve a medium dough consistency, similar to a regular French bread dough. Mix on medium speed to a medium level of gluten development. This might take about 4 or 5 minutes, but will depend on your mixer. 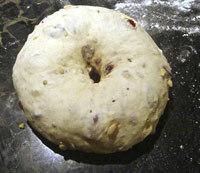 Add the cranberries, fennel, and pine nuts. Mix on low speed just until they are evenly incorporated into the dough. Transfer the dough to a lightly oiled container. Cover and ferment at room temperature for 1.5 hours. Turn the dough into a lightly floured counter. Preshape it into a light ball and let rest, covered, for 15 minutes. 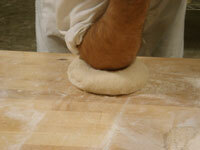 Shape the dough into a tight ball, cover, and let rest for another 15 minutes. To form the crown shape, pierce the ball in the center with your elbow, then pick the dough up and gently turn and stretch it evenly until the hole is about 5 inches in diameter. 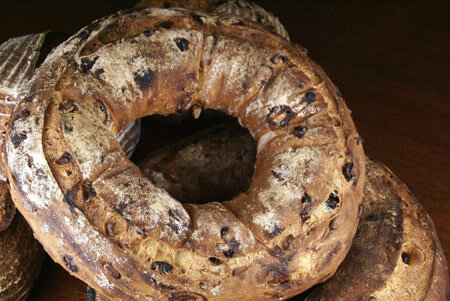 Place the shaped crown upside-down into a flour dusted, linen-lined couronne basket (or a makeshift one). Proof at room temperature, covered, for about 1 hour and 15 minutes. Or proof at room temperature for 30 minutes, then refrigerate for 2 – 12 hours. Just before baking, flip the crown right-side-up onto the peel and slash once in a circle around the crown. 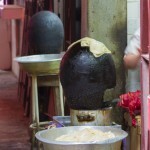 Once the crown is in the oven, reduce the temperature to 440F. 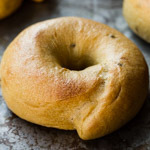 Bake for 10 minutes with steam, and another 25 minutes or so without steam. The crust should be a dark golden brown. Then turn off the oven and leave the loaf in for another 5 minutes, with the door ajar. This looks so tasty. Wishing I had a slice! Stunning! 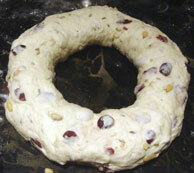 I love the couronne shape; thanks for the tip about rigging up a makeshift couronne proofing basket. 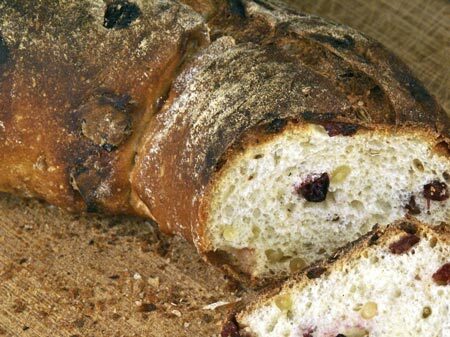 Your bread look really festive, you know I’ll probably be making this one too…..
Btw, I check everywhere (including Fantes and Brotforms) for a special couronne basket, they don’t really seem to carry it. 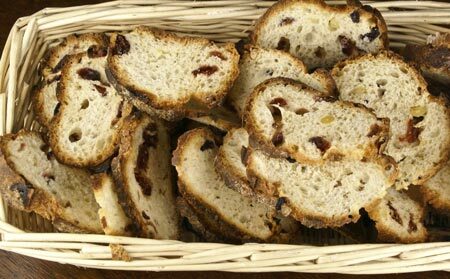 Oh, I want to let you know that I made the panettone, but mine was a bit on the drier side. I used the same starter that I used to make the norwich sourdough, I skipped the glaze, and I forgot to inserted the skewer before adding the dough. I did hung them up side down and inserted the metal skewer, do you think this was causing my panettone dry? I know, you’ve mentioned in your post, that some recipe require to insert the skewer after the bread being baked. Anyway, it was still delicious, fragrant, and I was so proud that I can make panettone. Do you think you will write a book in the near future? Your direction is so clear, but it just so much easier for people like me to just bring the book to the kitchen, instead of bringing my laptop. I also have tendency to get lazy to print-out recipe from my computer, then I have to go up stairs to study room to get it. I am sure a lot of your reader hoping that you’ll write a book! Oh, that looks so rustic and wonderful. I can almost smell it throught the screen! Hello Susan, I have been enjoying your wide selections of bread. They look great! My I ask have you taught yourself to bake? Ooh, I love the cranberry-fennel flavor combo. How festive! That is absolutely gorgeous. And I’m sure it tastes as lovely as it looks. Somehow I knew I’d be visiting your site and kicking myself for not checking it before I made my bread on Christmas. This is insanely gorgeous – I can’t wait to try it! Gretchen Noelle, Natashya, Angela, Dana: thanks so much and happy holidays! Jacqueline, I think the makeshift couronne basket is a great standin for the real thing, and anyone can do it. 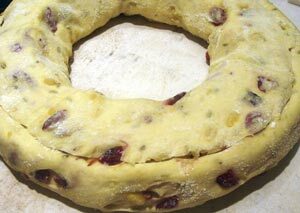 Elra, I have a couronne banetton I ordered from France but shipping was outrageously expensive so I don’t think I’d do it again, because the makeshift one wors so well. Sorry your panettone was dry, mine were a little dry this year too. And thanks so much for your vote of confidence about a book! Chuck, thanks! 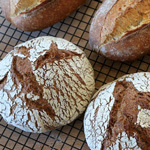 I have been fortunate to take some bread workshops at the San Francisco Baking Institute and I have learned a lot on my own also, by reading and experimenting. Jesse, I didn’t get this up until after Christmas anyway. Or maybe I’m 364 days early for next year. fantastic! It looks soooooo good. Simply gorgeous, Susan! I’ll have to try it. Susan, this is one fabulous bread! It’s a stunner to look at and it’s definitely earned a spot on my next try list. here’s wishing you and your loved ones a fantastic 2009, dear susan. I’ll take a slice with goat cheese, thanks. Gorgeous loaf! Loving the cranberries & pine nuts in it. Great bread. Can’t believe tmrw is the start of the new year – another year of great bakes to look forward to right? Happy new year to you & your family. Beautiful bread! The basket and upturned bowl idea is ingenious. Happy new year! Looks tasty! Happy New Years! You seem to always thrill Susan. Perfectly beautiful to look at and to wish I had a section – I know a slice wouldn’t be enough. Forget Christmas and New Years, this would amazing any time! It’s just perfect and I LOVE cranberries. I REALLY love your site. I love bread and baking. 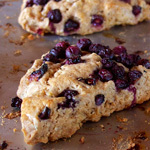 This is a recipe I would like to try, living in an old house in Kyoto Japan, doesn’t afford much chance to bake though. I have book marked this for next time I am state-side. Yesterday I baked your wonderful crown and it is so delicious. Here is mine. 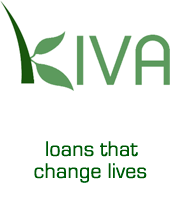 Your Blog is an inspiration for me and I like your hints and product presentations. Unfortunately many products like the Flipping Board or the Super Peel are not available in Germany. The crust on this looks super amazing! What a great bread for the holidays. 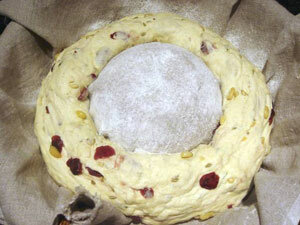 And such an interesting combination – cranberries, fennel, and pine nuts. Love it. 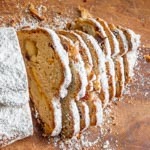 This looks great I got to your site from The fresh loaf, next time I’m going to do my bakes I will give this a try. Do you have any suggestions how I should bake this in my WFO or should I just handle it like any other bread? fantastic bread. I planned to make it for our new year eve dinner but as I forgot the starter to mature in the kitchen where the window was open (there’s about 15 degrees Celsius outside) it got ready a bit too late. So we ate it with the midnight champagne, topped with quite strong cheese – very very tasty combination. 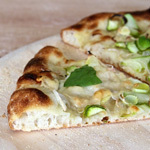 As I am not too huge fan of fennel I decided to add only 4 grams, and it was really enough for me (but to look from the other side – I have tried several receipes calling for fennel seeds and this is first time I don’t regret adding them :). Thank You for the receip! And – happy new year!